Buy Alphabets Book Letter Styles-Book for Sale here. A collection of Hand Lettered alphabets. Made for sign Painters back in 1982 to acquaint Sign writers with unfamiliar Letter styles. Alphabets Book Letter Styles-Book features 10 Sign Artists with bio's and their sample of the font of choice. In total I counted around 32 different letter styles fonts. This is excellent for Sign Writer or Pinstriper's collection. These Letter Styles are Cool, Fun and easy to reproduce. 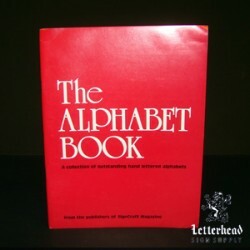 Alphabets Book Letter Styles-Book is in Paperback by Sign Craft in black and white with 48 pages. Click here to Buy and read more.